Did you know “ONE FC 7: Return of Warriors” is going off this weekend in Malaysia? With all the hoopla surrounding UFC 156, I nearly forgot, as well. In any event, that hasn’t stopped the up-start mixed martial arts promotion from announcing the featured attraction for their next card. 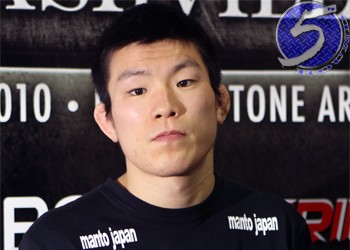 Former Dream lightweight champ Shinya Aoki (Pictured) will challenge Kotetsu Boku for the title on April 5th. Singapore Indoor Stadium serves as host. Boku captured the inaugural crown by defeating Zorobabel Moreira at the same “One FC 6” show where Aoki beat Lepont. This weekend’s event is available via Facebook and online pay-per-view.